^ Bennett & Lennon 1991, p. 7. ^ a b c d e f g h i j k l m n o p q r s t u v w x Rankin 1988, p. 218. ^ Bennett & Lennon 1991, p. 5, cf Ashe 1892, p. 496where Jane, Job's third wife, is attributed as his mother, and Rankin 1988, p. 218, where Howe's mother is called Sarah. ^ Bennett & Lennon 1991, pp. 2–3. ^ Bennett & Lennon 1991, p. 4. ^ a b Ashe 1892, p. 496. ^ Bellamy 1903, p. 3. ^ a b Bennett & Lennon 1991, p. 5. ^ Bellamy 1903, p. 4. ^ Powell & Hill 2010, p. 334. ^ Bennett & Lennon 1991, p. 5–6. ^ Lefler & Powell 1973, p. 244. ^ Kars 2002, p. 112. ^ a b c d e Ashe 1892, p. 497. ^ Bennett & Lennon 1991, pp. 13, 14. ^ Bennett & Lennon 1991, pp. 14–16. ^ Ranlet 1991, p. 722. ^ Kars 2002, p. 165. ^ Kars 2002, p. 161. ^ Bennett & Lennon 1991, pp. 15–16. ^ Kars 2002, p. 209. ^ Rankin 1971, p. 18. ^ Rankin 1971, p. 7. ^ Bennett & Lennon 1991, pp. 6–7. ^ Ranlet 1991, p. 725, expressing little doubt that Howe did engage in graft at Fort Johnston and that Tryon condoned it; but cf Lennon 1979, p. 75, noting that Howe actually added 25 soldiers to the garrison during his tenure. ^ Bennett & Lennon 1991, p. 16. ^ Bennett & Lennon 1991, pp. 16–17. ^ Ranlet 1991, p. 726. ^ Lefler & Powell 1973, pp. 257–258. ^ Lefler & Powell 1973, pp. 258–259. ^ Bennett & Lennon 1991, p. 24. ^ Bellamy 1903, pp. 6–7. ^ Rankin 1971, p. 11. ^ Lefler & Powell 1973, p. 270. ^ Rankin 1971, pp. 14–15. ^ Lefler & Powell 1973, p. 271. ^ Bennett & Lennon 1991, pp. 27–28. ^ Lefler & Powell 1973, p. 280. ^ Rankin 1971, pp. 16–17. ^ Bennett & Lennon 1991, pp. 28–29. ^ Bennett & Lennon 1991, p. 29. ^ Rankin 1971, p. 24. ^ Rankin 1971, pp. 25–26. ^ Rankin 1971, p. 26. ^ a b Clark 1906, p. 196. ^ Bennett & Lennon 1991, p. 38. ^ Whitaker 1908, pp. 1–2. ^ Bennett & Lennon 1991, p. 41. ^ Rankin 1971, p. 72. ^ Bennett & Lennon 1991, p. 43. ^ Rankin 1971, p. 80. ^ Bennett & Lennon 1991, p. 51. ^ a b c d Rankin 1988, pp. 218–219. ^ Bennett & Lennon 1991, p. 54. ^ Bennett & Lennon 1991, p. 56. ^ Bennett & Lennon 1991, p. 40. ^ Bennett & Lennon 1991, p. 62. ^ Bennett & Lennon 1991, p. 68. ^ Bennett & Lennon 1991, p. 75. ^ Bennett & Lennon 1991, pp. 79–80, 83. ^ Bennett & Lennon 1991, p. 80. ^ Bennett & Lennon 1991, p. 83. ^ Bennett & Lennon 1991, p. 87. ^ Bellamy 1903, pp. 9–10. ^ Godbold, Jr. & Woody 1982, pp. 184–185. ^ a b Godbold, Jr. & Woody 1982, p. 186. ^ Bellamy 1903, pp. 10–12. ^ a b Rankin 1971, p. 191. ^ Bennett & Lennon 1991, p. 96. ^ Bennett & Lennon 1991, pp. 95–96. ^ Bennett & Lennon 1991, p. 100. ^ Bennett & Lennon 1991, p. 98. ^ Ranlet 1991, p. 736. ^ Ranlet 1991, pp. 735–736. ^ a b c d e f Rankin 1988, p. 219. ^ Bennett & Lennon 1991, p. 103. ^ Babits & Howard 2004, p. 112. ^ Rankin 1971, p. 174. ^ Bennett & Lennon 1991, pp. 105–106. ^ Bennett & Lennon 1991, p. 106. ^ Bennett & Lennon 1991, pp. 112–113. ^ Bennett & Lennon 1991, p. 109. ^ Bennett & Lennon 1991, p. 114. ^ Bennett & Lennon 1991, pp. 128–129. ^ a b Bennett & Lennon 1991, p. 129. ^ Bennett & Lennon 1991, p. 139. ^ Bennett & Lennon 1991, pp. 140–141. ^ a b Ashe 1892, p. 498. ^ Bennett & Lennon 1991, p. 142. ^ Bennett & Lennon 1991, p. 149. ^ Davis & Bellas 1896, p. 81. ^ Bennett & Lennon 1991, p. 150. ^ Bennett & Lennon 1991, p. 151. ^ Bennett & Lennon 1991, pp. 151–152. ^ Bennett & Lennon 1991, pp. 152–153. ^ a b Bennett & Lennon 1991, p. 153. ^ “Revolutionary hero born in Brunswick County”. Wilmington Star–News. (1978年7月2日). http://news.google.com/newspapers?nid=1454&dat=19780702&id=NtROAAAAIBAJ&sjid=KxMEAAAAIBAJ&pg=7155,464678 2013年3月10日閲覧。 Note that the article incorrectly cites the date as 1908. ^ a b Ranlet 1991, pp. 740–741. ^ Ranlet 1991, pp. 727–728. ^ Ranlet 1991, p. 740. ^ a b Ranlet 1991, p. 741. ^ Ranlet 1991, p. 742. Ashe, Samuel A'Court, ed (1892). Cyclopedia of Eminent and Representative Men of the Carolinas of the Nineteenth Century. Volume 2. Madison, WI: Brant & Fuller. pp. 428–429. OCLC 17976871. http://books.google.com/books?id=wkYTAAAAYAAJ&dq=Cyclopedia%20of%20eminent%20and%20representative%20men%20of%20the%20Carolinas&pg=PA428#v=onepage&q=Robert%20Howe&f=false. Babits, Lawrence; Howard, Joshua B. (2004). "Fortitude and Forbearance": The North Carolina Continental Line in the Revolutionary War 1775–1783. Raleigh, NC: North Carolina Department of Archives and History. ISBN 0-86526-317-5. Bellamy, John D. (1903). Speech of Hon. John D. Bellamy, of North Carolina, in the House of Representatives, February 14, 1903 : on H. R. 17356, to erect an equestrian statue at Wilmington, N. C., to the memory of Maj. Gen. Robert Howe, of the American Revolution. Washington, D.C.: [s.n]. OCLC 758727519. http://archive.org/details/speechofhonjohnd131bell. Bennett, Charles E.; Lennon, Donald R. (1991). 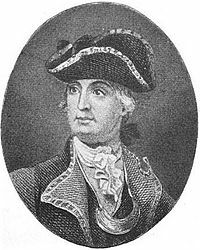 A Quest for Glory: Major General Robert Howe and the American Revolution. Chapel Hill, NC: University of North Carolina Press. ISBN 978-0-8078-1982-1. http://books.google.com/books/about/A_quest_for_glory.html?id=HGksAAAAMAAJ. Clark, Walter (1906). “James Hogun”. In Ashe, Samuel A'Court. Biographical History of North Carolina from Colonial Times to the Present. Volume 4. Greensboro, NC: C.L. Van Noppen. pp. 196–202. OCLC 4243114. http://books.google.com/books?id=EdKLfhkJIWEC&dq. Davis, Charles L.; Bellas, Henry H. (1896). A Brief History of the North Carolina Troops on the Continental Establishment in the War of the Revolution, With a Register of Officers of the Same, and A Sketch of the North Carolina Society of the Cincinnati, From its Organization in 1783 to its So-called Dissolution after 1790. Philadelphia, PA: [s.n.]. OCLC 3170032. http://books.google.com/books?id=b10vAAAAYAAJ&dq. Godbold, Jr., E. Stanley; Woody, Robert H. (1982). Christopher Gadsden and the American Revolution. Knoxville, TN: University of Tennessee Press/Knoxville. ISBN 0-87049-362-0. http://www.lib.utk.edu/newfoundpress/pubs/godbold/. Kars, Marjoleine. (2002). Breaking Loose Together: The Regulator Rebellion in Pre-Revolutionary North Carolina. Chapel Hill, NC: University of North Carolina Press. ISBN 978-0-8078-4999-6. Lefler, Hugh T.; Powell, William S. (1973). Colonial North Carolina: A History. New York: Charles Scribner's Sons. ISBN 0-684-13536-1. http://books.google.com/books?id=s5d8AAAAMAAJ&source=gbs_similarbooks. Lennon, Donald (1979). “Robert Howe”. In Watson, Alan D.. Harnett, Hooper & Howe: Revolutionary Leaders of the Lower Cape Fear. Wilmington, NC: L.T. Moore Memorial Commission, Lower Cape Fear Historical Society. pp. 68–100. OCLC 681825153. http://books.google.com/books/about/Harnett_Hooper_Howe.html?id=suQQAQAAMAAJ. Powell, William S.; Hill, Michael (2010). The North Carolina Gazetteer: A Dictionary of Tar Heel Places and Their History (Second ed.). Chapel Hill, NC: University of North Carolina Press. ISBN 978-0-8078-3399-5. http://books.google.com/books?id=FJSxQQAACAAJ&dq=. Rankin, Hugh F. (1971). The North Carolina Continentals (2005 ed.). Chapel Hill, NC: University of North Carolina Press. ISBN 978-0-8078-1154-2. http://books.google.com/books?id=pmDEMRA8_F8C&vq=%22james+Hogun%22&source=gbs_navlinks_s. Rankin, Hugh F. (1988). “Howe, Robert”. In Powell, William S. Dictionary of North Carolina Biography. Volume 3 (H-K). Chapel Hill, NC: University of North Carolina Press. pp. 218–219. ISBN 978-0-8078-1918-0. http://books.google.com/books?id=gejhoRgwLXwC&dq=Dictionary+of+North+Carolina+Biography:+H-K&source=gbs_navlinks_s. Ranlet, Philip (1991). “Loyalty in the Revolutionary War: General Robert Howe of North Carolina”. Historian 53 (4): 721–742. doi:10.1111/j.1540-6563.1991.tb00831.x. http://onlinelibrary.wiley.com/doi/10.1111/j.1540-6563.1991.tb00831.x/abstract 2013年5月2日閲覧。. Schaw, Janet (1921). Andrews, Evangeline W.; Andrews, Charles M.. eds. Journal of a Lady of Quality: Being the Narrative of a Journey from Scotland to the West Indies, North Carolina, and Portugal, in the years 1774 to 1776. New Haven, CT: Yale University Press. OCLC 1707492. http://docsouth.unc.edu/nc/schaw/schaw.html. Whitaker, Bessie (1908). Hamilton, J.G. de Roulhac. ed. The Provincial Council and Committees of Safety in North Carolina. Chapel Hill, NC: The University Press. OCLC 2974489. http://books.google.com/books?id=J0cOAAAAIAAJ&source=gbs_navlinks_s.